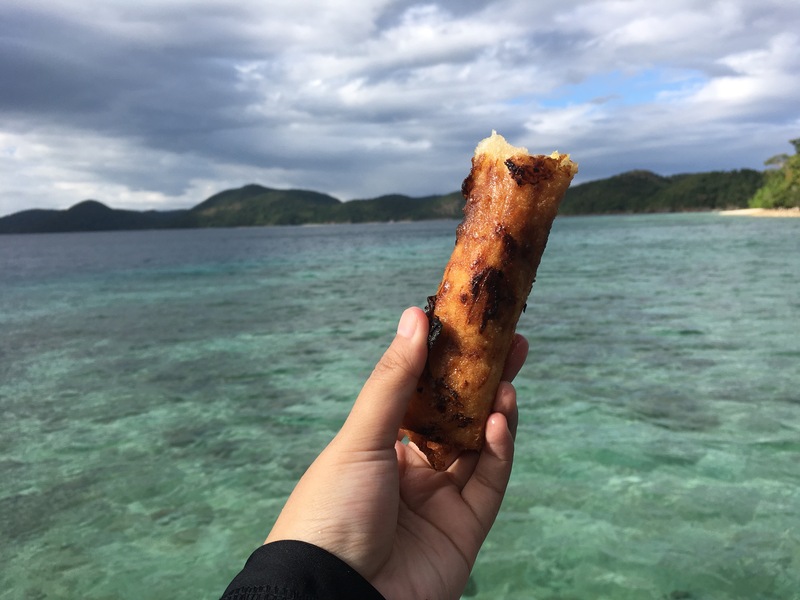 Our Coron trip has been short but enough to explore some good food around the town; 😋 so here goes my share of food itinerary if you are planning to visit this beautiful island. 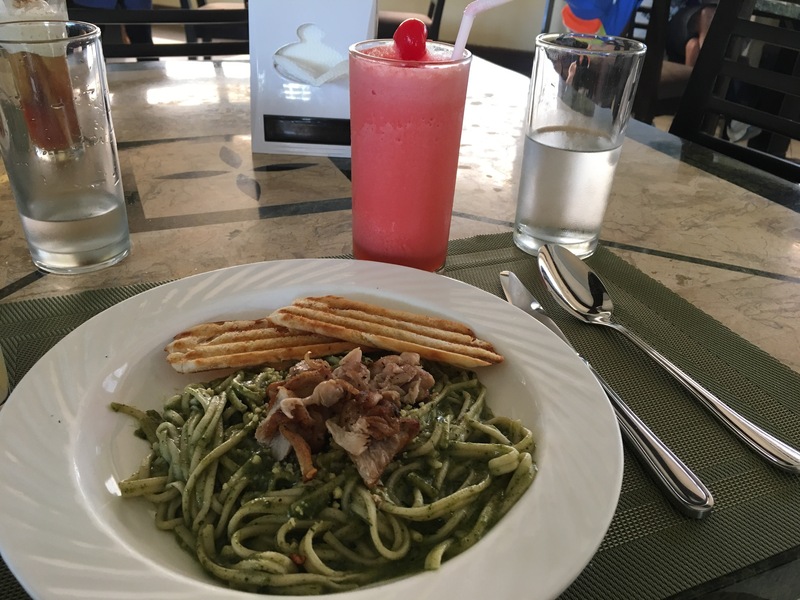 I have been looking forward to try this Italian restaurant since it has been hailed as the number 1 resto in Coron as per Trip Advisor. It’s located few blocks away from Mt. Tapyas but if you have just done more than a thousand steps, few blocks felt like a mile. haha Upon entering the resto, you have to remove your shoes which helps keep the floor really clean and shiny. The place was a little dark as well since you were supposed to have dinner with candle light. Servers and the foreigner owner (I assume) were very attentive to. We had a Hawaiiana Pizza(P410) and a glass of mango juice (P60). 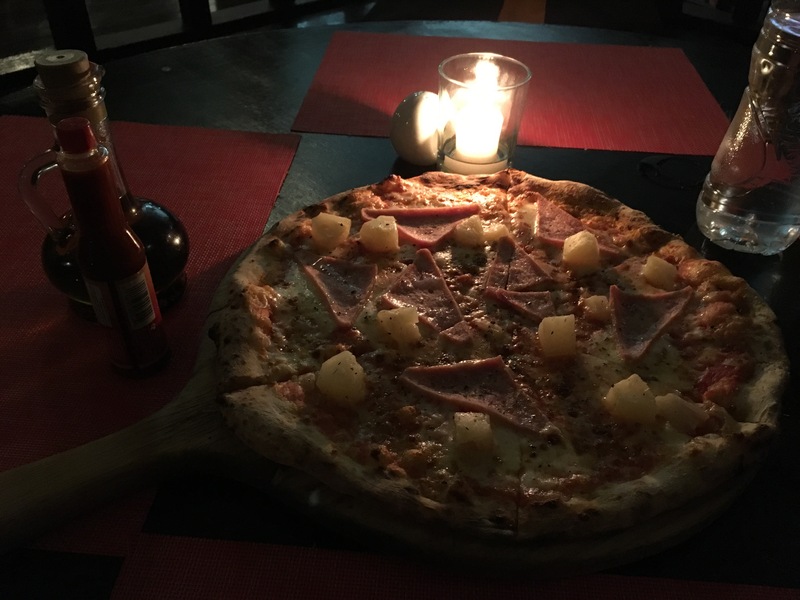 I have to say that the pizza tastes really good but I think we could’ve appreciated the place more if we ordered pasta; which we didn’t since the pizza is already 15-inch and we think it was enough for us. Still, I think the place deserves its number 1 spot. Since our accomodation came with free buffet breakfast, we had to take advantage of it. 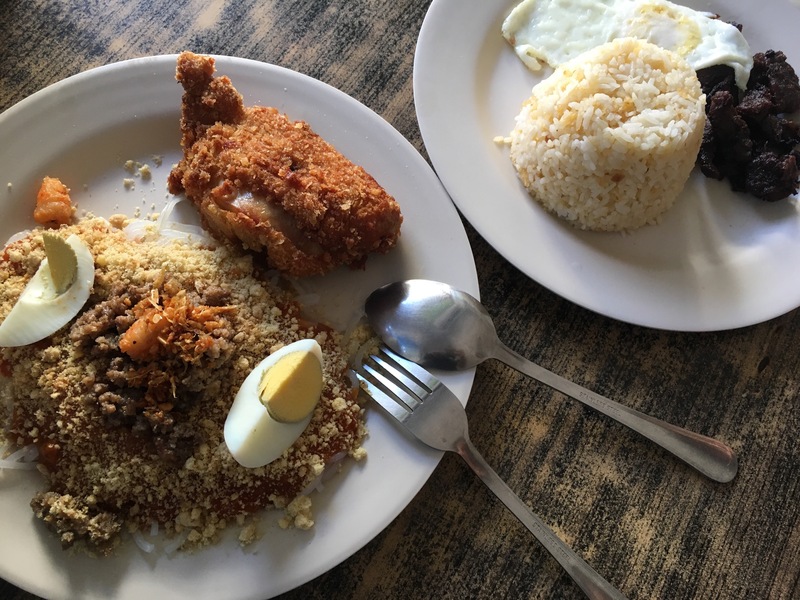 They have the usuals: fried rice, hotdogs, assortment of breads and spreads, salad, chicken nuggets, arroz ala cubana, tuna flakes, scrambled eggs, plus they have an egg and pancake station. Of course, there’s coffee and some juice. 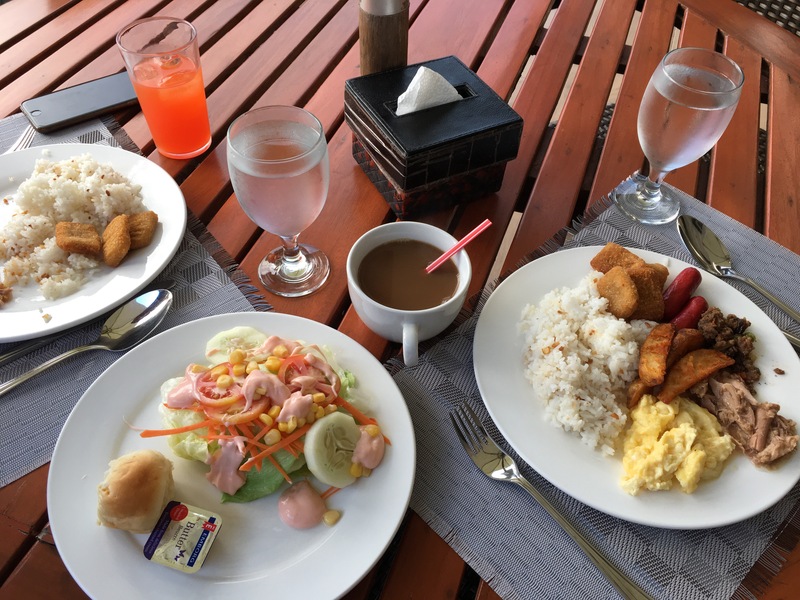 Their resto where breakfast is served is just in front of the pool, which gives an amazing view. After visiting the Malcapuya Island, which was our last stop, we were headed to another 1 and a half boat ride going back to their docking area. 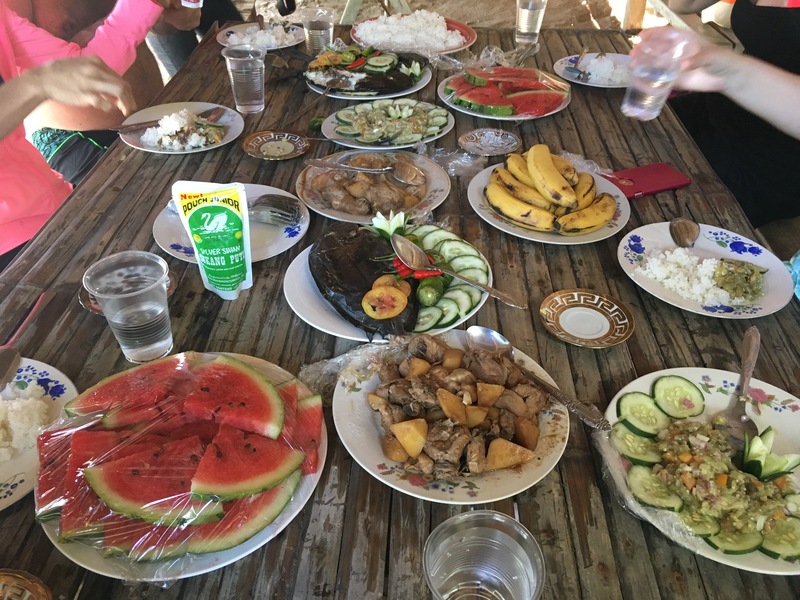 While at it, ate tour guide served turon and banana cue for snack. 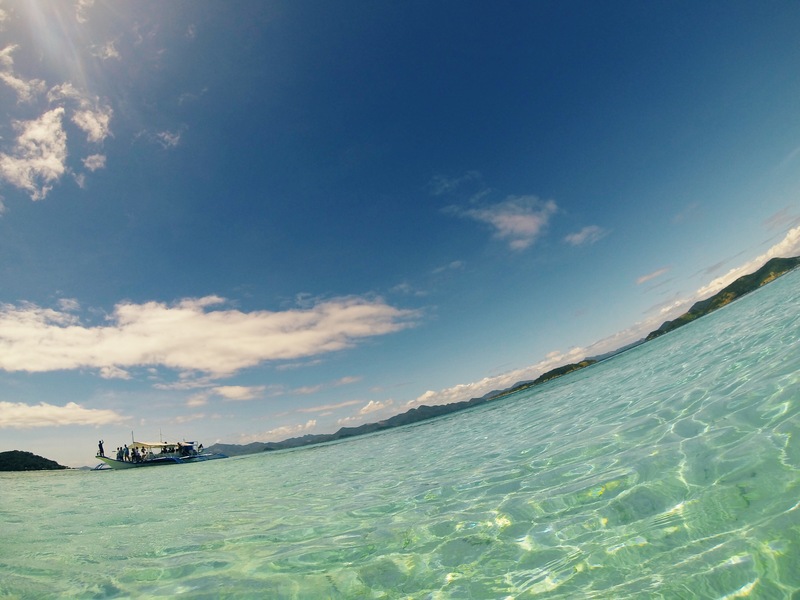 What better way to have it than while sight seeing the pristine waters of Coron! ahhhhh! After the tour, we freshened up in the hotel and headed back to town for dinner. We went to Santino’s Grill as per the recommendation of a friend; and I’m so glad I listened to her! 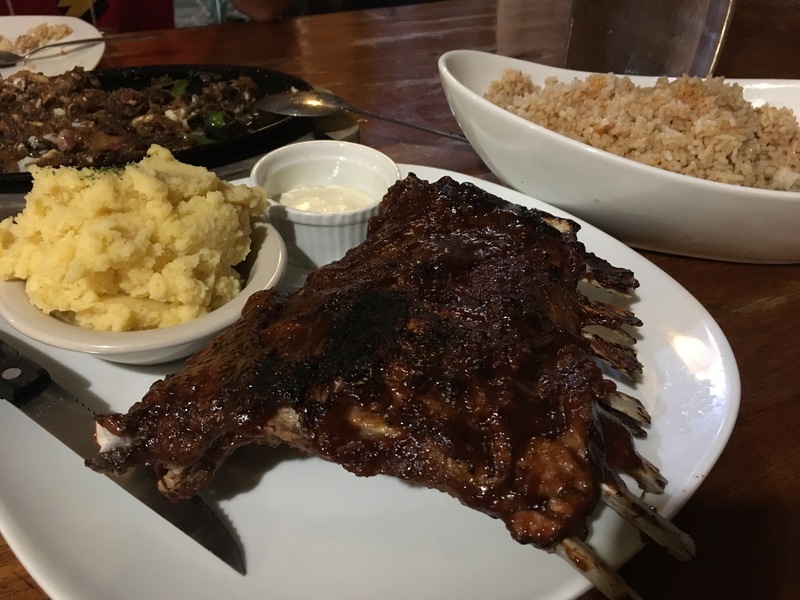 haha The specialty of the place is Baby Back Ribs, we had a half slab of it plus Pork Sisig (P180) plus a platter of garlic rice (P120). Let me just rave on how good the food were! Their ribs are fork-tender with just right amount of barbecue sauce! Well worth the P300 that we paid for it. Also the sisig was soooo good! Though a little oily, it was still good! We were not able to finish all of it since they came in big servings. 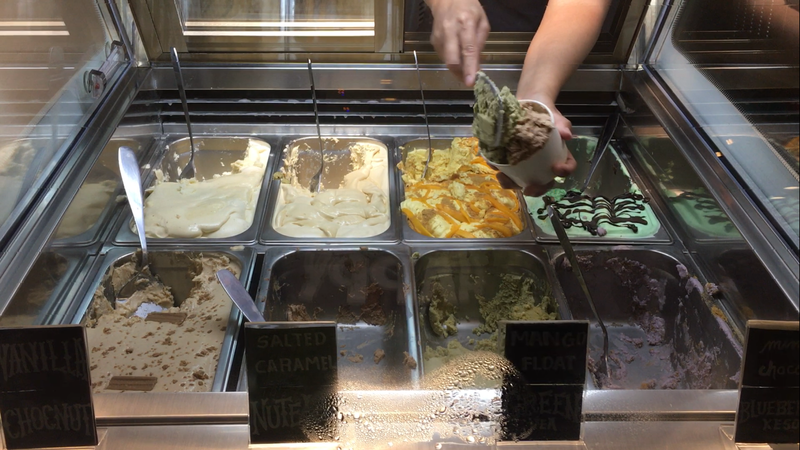 How I wish we have Santino’s here in Cavite. nyaha! Only bad thing about the place is the server, after being asked for the wifi password twice, never gave it to me. 😳 I don’t know if it slipped his mind (twice) or he really just doesn’t know the password. Oh well..
On our second morning and sadly last day in the island, we have decided to ditch the buffet breakfast in the hotel. (Well okay yeah we dropped by the hotel resto to check what they are serving and ended up eating some haha) Then we headed back to town to look for souvenirs. After that, we walked a little to Fika Indulgence for brunch. We were in a little rush since we arrived past 9am and they were closing at 10am. 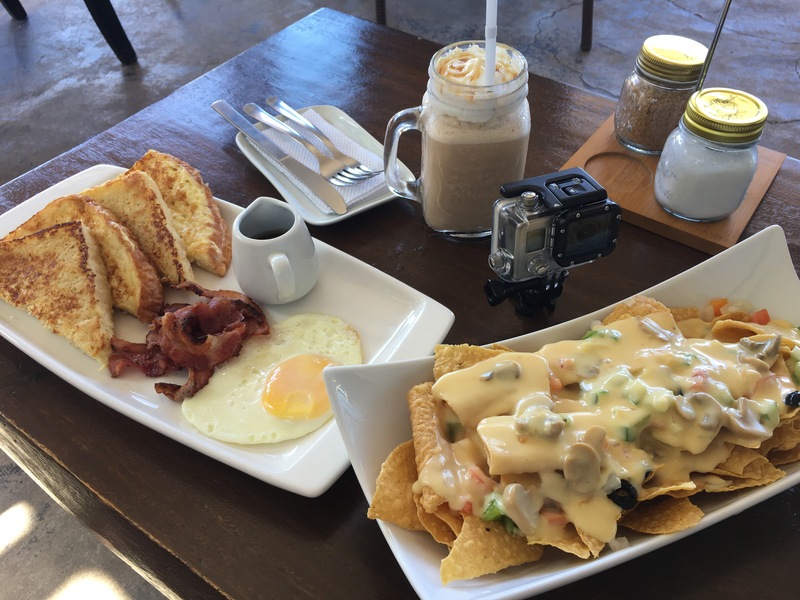 We had nachos, french toast with bacon and egg and C had a karamelokiato with is basically a blended caramel flavored drink hehe. Food were okay but the ambience was better. Walls were decorated with travel – related photos and quotes. Since I have a thing with airports and coffee, of course I wouldn’t miss this one. 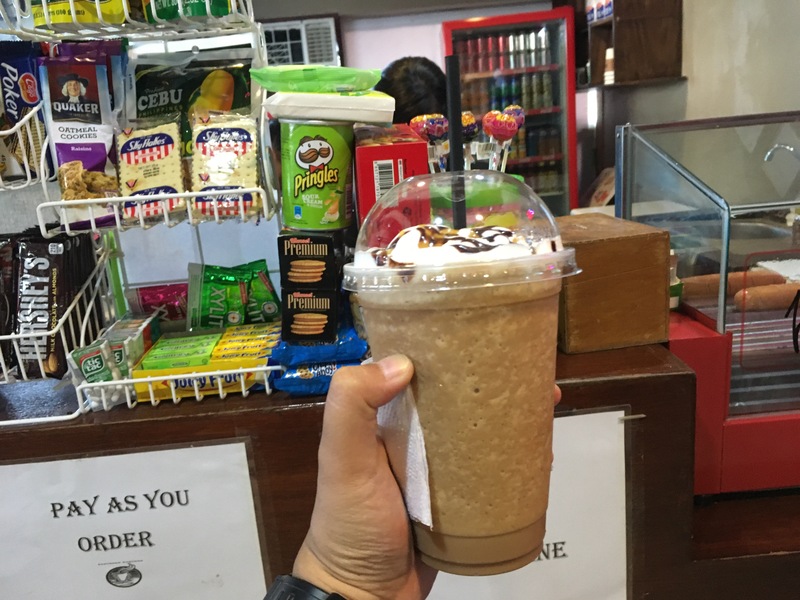 We had a blended drink (forgot what it’s called already) for P140; enough to help us cool down while waiting to board.